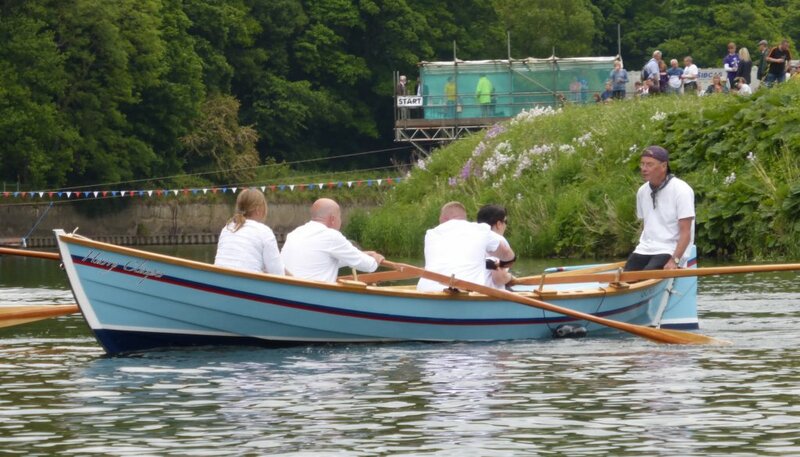 There was cause for special celebration at this year’s Durham Regatta, the second oldest regatta in the country, staged for the 182nd time on June 13th and 14th 2015 and coinciding with the bi-centenary of the Battle of Waterloo. The Regatta owes its origin to the annual procession of boats, organised by the Sheriff of County Durham, the Rt. Hon. William Lloyd Wharton, in June 1815 to celebrate the ‘famous victory’ at Waterloo. The annual procession continued for many years, but Durham Regatta in its present form dates back to 1834, with racing taking place over two days on the River Wear from Prebends Bridge to Pelaw Wood. From 1815 onwards, local veterans of Waterloo and the Peninsular War, the ‘Waterloo Men’, had celebrated the anniversary of the battle on June 18th. This typically involved them marching through the City, assembling on the riverbanks and firing off cannon, as the bells of the cathedral and other city churches rang out. In 1834 the anniversary fell on the second day of the regatta and the Waterloo men celebrated in style in the evening, with forty-three of them being treated to ‘a substantial supper and a plentiful supply of strong ale and punch’ provided to them by a Captain Chipchase, himself a veteran of the Peninsular War. In later years, the tradition developed of Durham Regatta promising free ale to anyone who could prove that he had fought under Wellington at Waterloo or in the Peninsular War. After extensive research organisers of this year’s Regatta succeeded in tracking down descendants of Waterloo man Private Andrew Knox, and provided them with a free meal and quantities of Waterloo Ale, specially brewed for the occasion by The Durham Brewery. Over and above the two packed days of competitive racing, with over 500 races taking place, a highlight of this year’s event was a series of re-enactment races, seeking to re-create a flavour of regattas of the 1830s, and including a procession of boats, which took place at Saturday lunchtime during an hour-long break in the racing programme. The re-enactment included a Wear Scurry and a 9-abreast skiffs race for scullers. Originally a Wear Scurry was a race in which miners took part using shovels as paddles. It became known as the ‘trimmers race’ due to its popularity with coal trimmers who used their heart-shaped trimming shovels as a means of propelling the boats. Coal trimmers worked in the shipyards packing coal into the hold of ships. The final job in loading the coal was very much ‘hands on’ for the trimmers, who crouched on their knees inside the hold of the ship and began sweeping the coal behind them, into the corners using their custom-made heart-shaped shovels – an action similar to that of paddling a canoe. A set of replica paddles was fabricated from scratch especially for the occasion by Durham ARC members Derek Gordon and John Appleby. Skiffs were kindly provided by Browns Rowing Boats, with volunteer paddlers and scullers coming from the senior women and off-peak men of Durham ARC, the Three River Serpents Dragon-boaters, College of St Hild and St Bede and British Rowing, all attired for the occasion in 1830s style in recognition of the presence at the Regatta of the playwright and lead actor of ‘Hadaway Harry’, a play written by Ed Waugh and featuring Jamie Brown in the role of North-East sporting icon Harry Clasper, which takes to the stage at venues throughout North-East England over the summer and celebrates the 170th anniversary of Clasper and his brothers sensationally bringing the World Rowing Championship to the region in June 1845. As well as the coal trimmers and skiffs the procession of boats included St Ayles skiffs ‘Harry Clasper’ from Gateshead Community Rowing Club and ‘Crofton’ from Blyth Community Rowing Club, and the Row2Recovery boat which will be taking part in this year’s Talisker Whisky Atlantic Challenge. Row2Recovery, the charity that supports adaptive rowing for the military, was selected in April 2015 as Durham Regatta’s first ever charity partner. The parade, acknowledged as the highlight of the weekend, culminated in the playing of the National Anthem and Rule Britannia by Durham University Brass Band and a salute in celebration of the victory of the Duke of Wellington at Waterloo. This entry was posted in Event News on July 1, 2015 by Colin Lawson.